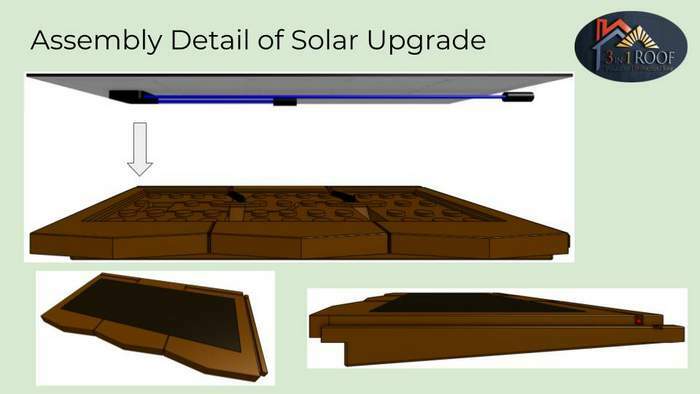 The 3 In 1 Roof solar integrated roofing system is reaming with SunSpark Technology Inc. as their module manufacturer for all introductory sales and installations. Although their name is new in North America, it’s not new to the solar industry. SunSpark’s parent company Yiheng Science & Technology Ltd. is based out of Qinhuangdao, China, and has been in the solar panel manufacturing equipment business for more than 20 years. SunSpark’s CEO Sunny Zhang is a business woman with deep roots in the solar industry since the early 1980s. Both companies will work in tandem to produce up to 3-MW of integrated solar roofs throughout 2019 and up to 280 MW by year ending 2024. The two companies plan on creating hundreds of direct USA and Canada manufacturing jobs. What is the 3 In 1 Roof? 3 IN 1 ROOF systems retro-fit any residential or commercial slope roof top regardless of the structure’s load bearing capacity. Couple that fact with Class-AA fire rating (self-extinguishing), Class-AA wind rating (200+ mph resistance), Class-AA impact rating (spot-repetitive strike protection), Class-AA solar-gains (zero heat transference into attic area), lifetime roof-tile warrantee, 30-year solar cell warrantee, technology agnostic removable and upgradable solar modules. The 3 In 1 Roof is making a play to be the most efficient, easy-to-install residential solar system design.